Amid ongoing media coverage about the dangers of Hurricane Florence—which has already killed multiple people in North Carolina—and warnings from extreme weather experts that such storms are made worse by human-caused climate crisis, the “bigger, stronger, and more dangerous” Super Typhoon Mangkhut made landfall early Saturday in the northern Philippines with sustained winds of 165 mph and gusts up to 200 mph. The United Nations Global Disaster Alert and Coordination System warns the storm “can have a high humanitarian impact based on the maximum sustained wind speed, exposed population, and vulnerability,” estimating that more than 40 million people across the Philippines, China, Vietnam, Guam, and the Northern Mariana Islands could be affected by the storm. Called Ompong locally, the storm’s threat to Luzon—the Philippines’ biggest and most populous island—prompted “officials to order precautionary evacuations and closures of schools and offices, and farmers to quickly harvest their crops to reduce damage,” The Philippine Star reports. Mangkhut made landfall in Baggao, Cagayan at 1:40am local time on Saturday, according to the the Philippine Atmospheric, Geophysical, and Astronomical Services Administration (PAGASA). 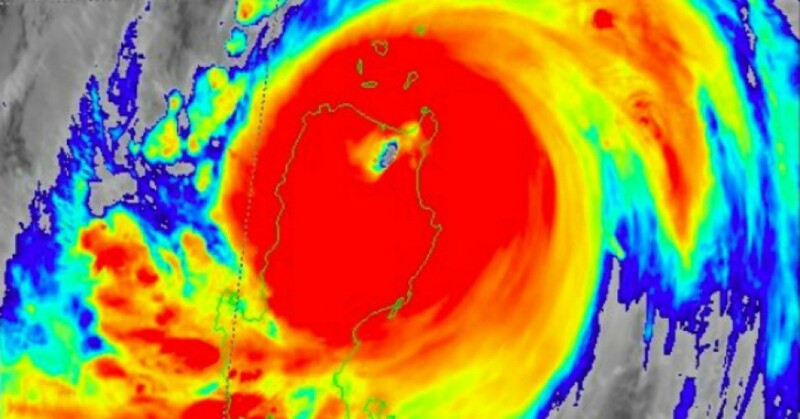 PAGASA is warning of up to a 20-foot storm surge and strong winds that could cause “severe” and “extensive” damage to coconut, rice, and corn plantations. Mangkhut and Florence not only have provoked evacuations and concerns about public safety, but also alarm over the future of incredibly destructive storms, and the impact of anthropogenic global warming. 9 tropical storms wrapping around the world right now.